Education Bachelor Degree in Economics from Jacksonville University, USA (Representing Emirates Development Bank, UAE). 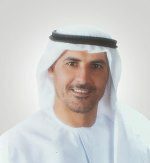 Saeed Mohamed AlBahhar holds directorship on the Boards of the Emirates Development Bank, Takaful Re Ltd, U.A.E., Arab Satellite Organization, K.S.A. and Hellas-Sat Cyprus.